Like many vehicles, there are a host of regulatory and operation costs associated with owning a private houseboat. These fees are usually probative for many families. Most boat enthusiasts only make it onto their local lakes a couple times a year. Working people generally only have a week or two each year to experience a real vacation. If you are hoping to partake in a houseboat adventure with your family, it is most cost-effective to just rent a vessel. You will not be responsible for many of the state and federal fees nor will you be required to pay for services required to use, upkeep, and maintain a private boat. The State of California requires any motorized boat and all sailboats measuring more than eight feet in length to be registered prior to its operation. Boat trailers must then be registered in order to tow your vessel on our roadways. As these fees are due payable by the titled owner of a vessel, they are easily avoided with houseboat rentals. The marina from which you rent a boat will have paid all the fees associated with its operation. Initial registration fees, ranging from $29 to $49 and the subsequent $20 bi-annual renewal costs are covered. Not only will this save you money, it will also make it less stressful to stay within the state’s guidelines. As of January 2018, the California Department of Motor Vehicles (DMV) requires all boat owners to obtain and maintain a California Vessel Operator Card (CVOC) in order to register or renew their houseboat registration. Much like a drivers license, operators now have to complete an approved boater safety course, either online or in a classroom. The California State Parks Division of Boating offers this course for only $10, but for someone who plans to only boat once or very rarely, this cost can be avoided. The boater safety course and its associated cost can be easily avoided with a boat rental. Because this requirement only applies to owners, the state does not require renters to obtain a CVOC. The federal government owns many of the nation’s inland waterways. As a way of financing the upkeep of these public use spaces, there are fees due for many of the activities in and around rivers and lakes. One of these fees is comparable to rental rates for the operation of private houseboats more than 31 feet in length. 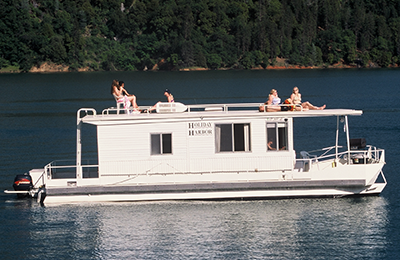 In 2010, an appraisal determined that the value of Recreational Occupancy Vessel (ROV) permits is significantly more than $7,000 for Shasta Lake use. The permits are usually sold with vessels and there a limited number are made available. Finding a houseboat with a valid permit is difficult and buying a detached permit is nearly impossible. Owning a vessel as large as a houseboat requires a lot of space for storage. Boat owners must have property, rent space at a local storage facility, or pay for a marina slip. Land is not cheap and neither are rental fees for slips. Storage facilities may cost a little less, but this will require you to pay for towing and launching fees when you arrive at the lake for your vacation. Boat rentals provide customers with easy access to these vessels. Your houseboat will be well-equipped, maintained, and waiting at a dock for your family. You simply pay your rental fees, climb aboard, and begin your adventures. On top of it, most marinas offer other services such as tackle shops, toy rentals, and dining opportunities. Docking your rented houseboat is included in the price, whereas private owners will have to pay for this service. Though not a requirement in California, basic liability insurance is highly recommended by the DMV. Having insurance on a private houseboat undoubtedly saves boat owners money in the event their vessel causes injury to another person or damage to their property during its operation. Additionally, by carrying comprehensive insurance on a boat, the owner is further covered for the cost of repair or replacement aboard their own vessel following a collision. Marinas often offer the renters of their houseboats what is referred to as a “Hull and Outdrive Damage Waiver” for less than $10 a day. Many facilities do not require this waiver to be purchased, but in the event you or another passenger causes damage to the boat, the damages will be covered. Most renters consider this a small fee when compared to annual insurance rates for a private vessel that is not used on a daily basis. So if you and your family enjoy houseboating vacations or would like to host an event on a beautiful lake, renting a vessel really is your least expensive option. Not only that, but the amenities and services offered by these businesses will ensure that you and your loved ones have a stress-free holiday.